Although Newyorkitis has been largely forgotten today, it caused a stir on publication. “Rarely has a book fresh from the press attracted so much attention,” touted The New York Press. 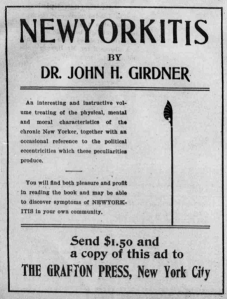 “[I]n all sections of the country has appeared column after column – and even whole pages – concerning Dr John H. Girdner’s Great Book,” The Commoner wrote later that year.